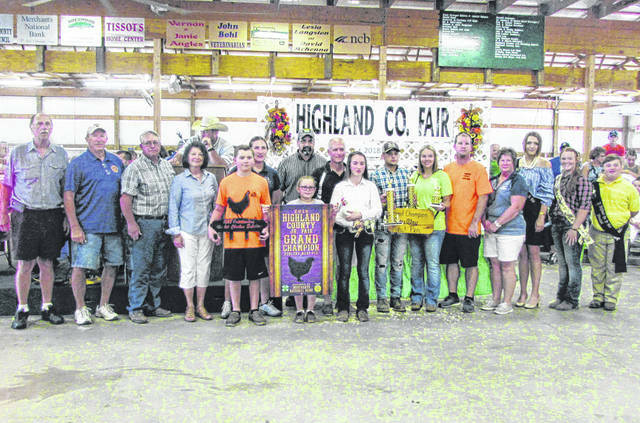 Hope Wyckoff’s Grand Champion Meat Pen sold for $3,200 Thursday at the Highland County Fair. Wyckoff also won Outstanding Market Exhibitor honors. The bird was purchased by 4 A Farm - Kevin and JoHeather Arnett, A-1 Tree Care, The Cassner Foundation, Chris Hopkins Transportation, Edgington Funeral Home, Higgins Steel Roofing, Highland County Republican Party, Kentucky Fried Chicken, David and Lesia McKenna, Merchants National Bank - Hillsboro, Ponderosa Steakhouse, R&R Fabrication by Design Show Equipment, Rhodes Electric Inc., RhonFarm LLC/Neil Rhonemus Family, Rhonemus Valley Farms, VFW Post 9094 and Jason and Buffy Wyckoff. Hope Wyckoff’s Grand Champion Meat Pen sold for $3,200 Thursday at the Highland County Fair. Wyckoff also won Outstanding Market Exhibitor honors. The bird was purchased by 4 A Farm – Kevin and JoHeather Arnett, A-1 Tree Care, The Cassner Foundation, Chris Hopkins Transportation, Edgington Funeral Home, Higgins Steel Roofing, Highland County Republican Party, Kentucky Fried Chicken, David and Lesia McKenna, Merchants National Bank – Hillsboro, Ponderosa Steakhouse, R&R Fabrication by Design Show Equipment, Rhodes Electric Inc., RhonFarm LLC/Neil Rhonemus Family, Rhonemus Valley Farms, VFW Post 9094 and Jason and Buffy Wyckoff. https://www.timesgazette.com/wp-content/uploads/sites/33/2018/09/web1_f-grand-champ-meat-pen.jpgHope Wyckoff’s Grand Champion Meat Pen sold for $3,200 Thursday at the Highland County Fair. Wyckoff also won Outstanding Market Exhibitor honors. The bird was purchased by 4 A Farm – Kevin and JoHeather Arnett, A-1 Tree Care, The Cassner Foundation, Chris Hopkins Transportation, Edgington Funeral Home, Higgins Steel Roofing, Highland County Republican Party, Kentucky Fried Chicken, David and Lesia McKenna, Merchants National Bank – Hillsboro, Ponderosa Steakhouse, R&R Fabrication by Design Show Equipment, Rhodes Electric Inc., RhonFarm LLC/Neil Rhonemus Family, Rhonemus Valley Farms, VFW Post 9094 and Jason and Buffy Wyckoff.